The Document of the Month for June from the National Archives of Ireland is a 1950s Department of Health poster. 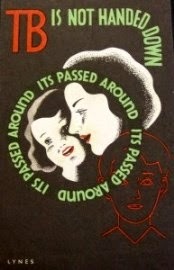 It was originally published as part of a nationwide campaign against tuberculosis. Immunisation and the arrival of antibiotics in that decade finally brought the TB epidemic to an end. Having spread from North East Ulster, Belfast and the linen mill towns of the north, it had spread like wildfire across the island in the second half of the 19th century and there won't be many Irish family historians without a death certificate recording the death of an ancestor from tuberculosis, consumption, phthisis or P. Pulmonalis (or similar) in the Cause of Death section of the registration document. The epidemic peaked in 1904, but TB remained a major cause of death in Ireland, then one of the poorest countries in Europe, as late as the 1940s, when around 4,000 people succumbed each year. A diagnosis was pretty much a death sentence. The lucky ones were those who survived years, and often surgery, in the TB sanatorium. There was a terrible stigma attached to the disease; I remember my Nana making up a nonsense story when I enquired about the death of her youngest brother, Jim, and his wife, both aged around 40, who had died on the same day in 1954; 50 years later, copies of their death certificates revealed what I'd long suspected... they had died of TB. Ever the snob, my gran could not cope with the infection's association with poverty and slum living conditions. Even by the 1950s, when this poster was published, there were around 7,000 cases of TB notified every year; by this time, however, many of those who became ill could be saved.